Oh my goodness. I don’t post sandwiches very often because it often doesn’t feel like a “recipe” to me, but this California Club Sandwich made me change my mind. This recipe is hands down one of the best sandwiches I’ve ever eaten. I want to eat it every day. My humblest apologies, sandwiches, y’all can make pretty darn outstanding recipes and I will try not to neglect you so moving forward. When I was trying to decide what I wanted to make today, nothing sound quite right. Eventually the concept of a BLT evolved into a California BLT (just add avocado) and that turned into a California Club (also add deli meat) until I knew I’d hit on my mental craving jackpot. Since avocado lends kind of a freshness already, I thought it would be fun to run with that and add a few other fresh flavored mix-ins to some low fat mayo and settled on lemon and basil. I can’t gush about this sandwich enough. 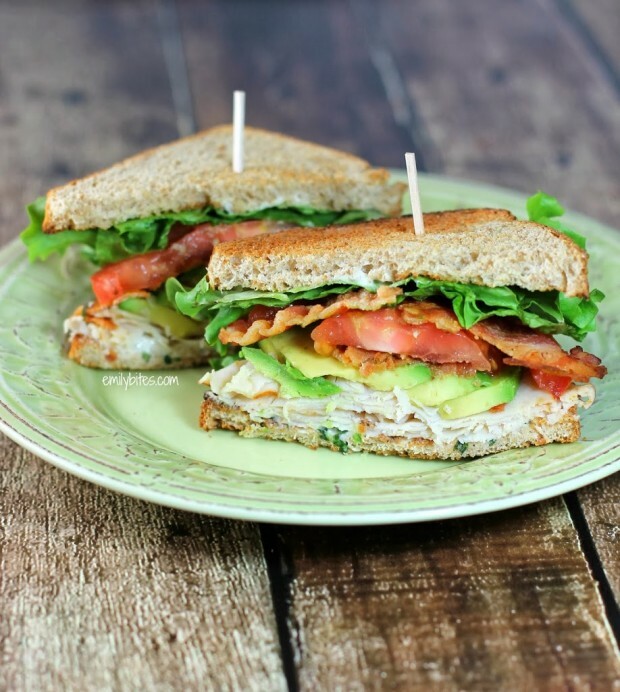 Golden toasty bread, juicy tomato, rich, buttery avocado, salty, smoky bacon, creamy, bright lemon-basil mayonnaise, sliced deli meat and a couple pieces of fresh green lettuce; it’s an explosion of flavors and they all come together perfectly. This tastes like a sandwich you’d order in a restaurant, but it comes together really quickly in the privacy of your own home for only 9 Weight Watchers SmartPoints and only 287 calories! If you cook the bacon and stir together the mayo ahead of time this is even a convenient recipe for you to assemble at lunch time, even on work days. This hearty sandwich will keep you feeling full for hours and put a smile on your face. That’s a sandwich I can count as a recipe. Cook the bacon slices according to package instructions and allow to dry on paper towels. In a small dish, combine the mayo, basil and lemon juice and stir until well combined and set aside. Toast the bread slices in a toaster until golden. Take two toasted slices and lay them side by side. Spread 1 tablespoon of the basil mayo onto one of the slices. Place 2 oz of the deli turkey or chicken over the mayo and spread avocado slices from ¼ of an avocado over the meat. On the other slice of bread, stack 1-2 pieces of lettuce and one slice of tomato. Criss cross two slices of the cooked bacon over the tomato. 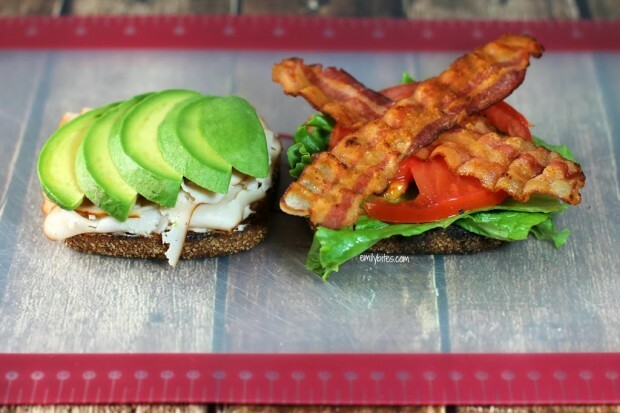 Flip the BLT side over onto the turkey side to form a sandwich. Repeat with the three remaining sandwiches. Cut in half and serve (you may want to stick a sandwich pick into each half before slicing to keep the ingredients perfectly stacked). A muffin marathon sounds amazing! Love it. So glad they’ve been such a hit! Yum! This looks so awesome. I am totally going to make this. This looks amazing!! I have been trying your WW recipes and thank you!! Your making it so much easier for hubby and I to keep on our goals!! Thanks!! I can’t seem to pin it, WAAHHHH I’m going to check out to see if it’s on your pinterest page. Haha, no more tears! You should be able to pin it, everything is just moved around a bit! It you hover over any photo in the post a little “pin it” button will appear above the upper left corner of the picture you can click there to pin or use the pin it button at the bottom of the post amongst the other social share buttons. OR it is on my pinterest page. I hope that helps! What would the PP be if I removed the avocado? I’m not a fan of that , but this sandwich sounds great!! I tried this recipe last week and I really liked it! I just got a craving for a club sandwich and luckily had all these ingredients around the house. I made my bacon a little too crunchy, but other than that, it was amazing. Thanks for sharing this recipe!